How do you keep cars from killing people? Ever since the automobile first started clogging city roads and competing with pedestrians for street space, planners and politicians have sought engineering solutions for road safety. And engineer we have. From advanced electronic stability and traction controls programmed into cars to yawning shoulders and clear-cut forgiveness zones carved out by the roads, we have deployed every trick we can muster to separate drivers, passengers, and pedestrians from danger. Yet a century after the Model T first started rolling out of Detroit in monochrome masses, at least 30,000 people are killed in motor vehicle crashes in the United States every year. In response, New York City mayor Bill de Blasio has declared war on his own city’s couple hundred annual traffic fatalities, aiming to eliminate pedestrian deaths from the roads of New York. Drawing on the lessons of Sweden’s Vision Zero initiative, de Blasio has marshaled all the agencies within his reach and sought special sanction from the state legislature to drive down automobile speeds and protect pedestrians. This week he announced the installation of 140 new speed cameras near city schools as part of the aggressive enforcement component of his safety push. The NYC Vision Zero plan includes lowering the citywide speed limit from 30 to 25, dramatically expanding enforcement measures such as police deployments and speed and red light cameras, and rebuilding what roads they can in order to better buffer pedestrians and bicyclists from traffic. There are certainly some positive and productive ideas incorporated into the Vision Zero initiative. But much of his rhetoric and many of his measures betray a throwback to older efforts to tame the roads by force and regulation. 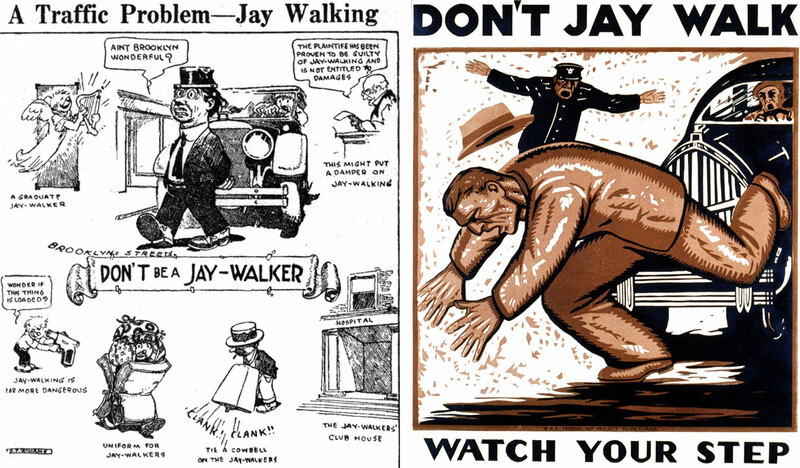 The history of the automobile and safety campaigns in the 20th century is too rich and varied to exhaust here, but a few highlights (or lowlights, as the case may be) can provide enough of a flavor for context. As Hunter Oatman-Stanford recounted earlier this year, In the Beginning (1900 or so), streets were shared by all modes of transportation. Pedestrians (then better known as people going about their business), horses, streetcars, and the early automobile all took their turn passing through the public space that happened to lie between destinations. Children played in the streets, with the protection of a common law understanding that with great vehicular weight came great responsibility. Forgiving Highways is a concept that designs roads to ‘forgive’ mistakes made on the road. It seeks to smoothly redirect the vehicles that leave roads, and allow wide enough clear zones to bring vehicles to controlled stops if and when they leave the roads. Breakaway supports, burying the end of guardrail, clearing the roadside of unneeded obstacles, and flattening and rounding slopes and ditch sections became standard design as part of the concept. U.S. engineers saw the success of the Interstate in forgiving mistakes and reducing accidents, and sought to apply its lessons to any paved surface they could get their hands on. As Toth writes, “It sounded logical at the time… and a great political solution, because the responsibility for fixing the problem once again fell on government, not the individual. We dove deep into the Forgiving Highway philosophy and still have not come up for air.” Separation, wide berths, and buffers became de rigueur. Our city and suburban streets became as wide and comfortable as our freeways, but for some reason we expected drivers to ignore everything we built around them and obey the increasingly fractured and detailed signage telling them to slow down. The Dutch, on the other hand, also applied Forgiving Highways to their highways, and adopted many of the same technology and education campaigns, but they took a very different approach to their built-up areas. Suburbs and cities were not treated as freeways, wide open roads to be blasted down with obstacles set at a safe distance. Instead, they created “self-explaining streets.” By accommodating all modes of transportation on their streets, not just the automobile, and by subtly signaling that cars would be sharing their space with pedestrians and bicycles, and most of all by shrinking the lanes and lines of sight available to their drivers, the Dutch put drivers in a position to slow themselves by common sense. And their fatalities have fallen from 3,200 in 1975 to 800 in 2008. Having started with a traffic fatality rate 20 percent higher than the United States, the Dutch presently enjoy a rate 60 percent lower. In the delightfully perverse phrase of “shared space” pioneer Hans Monderman (also Dutch), in order to make streets safe, you must first make them dangerous. For wide, straight roads with large buffers, any visual obstacles swept aside, naturally signal safety and the absence of surprises to a driver. It’s why highways function so well in transporting vehicles large distances at great speed: drivers don’t have to worry about children chasing a ball out from behind a tree, or parked car. They are roads for dumb drivers, which is why roadtrips are particularly well suited to listening to books on tape, or the radio, or just pondering in peace. Dumb roads let us divert our attention productively while almost unconsciously following the cues of the road. City and suburban streets are so radically different in use and purpose from highways as to deserve their very different names. Children just might run out into the street, because they live around the corner. A shopper just might walk out from behind a parked car, because there’s a storefront by the sidewalk. As Lynda Bellalite modeled for Quebec’s roads, credible speed limits are set by the number and width of lanes, the width of visual clearance, and the type of surrounding buildings. To design a peopled street like a dumb road is to tell drivers to speed up and space out. Lining such a street with speed cameras is less traffic enforcement than traffic entrapment. Instead, safety can best be secured by breaking down the century of segregation, and letting drivers notice that they are not alone. “Shared space” will be a concept frequently covered here at New Urbs, as it is a uniquely powerful example of how humane insights can overturn decades of planning wisdom to achieve better outcomes by empowering people, not engineers. Shared space was born out of the Dutch villages that Hans Monderman was charged with making safer in the face of children being struck by vehicles. Dissatisfied with the traditional traffic engineer’s toolbox of signs and lines, humps and bumps, barriers and warnings, Monderman sought to make the villages more… village-like. He tore out the signs and lines, flattened the humps and bumps, and restored the aesthetic of a village plaza to what had previously been an anonymous intersection. As Tom Vanderbilt describes it, “Rather than clarity and segregation, he had created confusion and ambiguity. Unsure of what space belonged to them, drivers became more accommodating.” Monderman forced drivers to actively engage their environment, and they took closer care of their behavior in it. Yet as Ben Hamilton-Baille delighted in demonstrating in his own shared space reforms in Poynton in the UK, traffic can move more efficiently even with all these sentient obstacles sharing the road, because no time is wasted waiting on stoplights to give cars permission to move. While I wouldn’t necessarily recommend a village traffic model for one of the most populous major cities in the Western world, it should be noted that London’s Kensington High Street has been able to incorporate shared space elements (removing pedestrian barriers, stripping signage and street clutter) despite carrying more than 40,000 cars per day, on par with many of New York City’s busiest (and most dangerous) streets. Car speeds are down, and even with more pedestrians recklessly crossing outside of designated areas, accidents are down as well. The contrast between engineering traps to catch or restrain drivers in the hopes of discouraging them from bad behavior, and engineering environments that lead them to naturally respond to their surroundings in a safe and humane way, should hold lessons for safety-concerned communities on this side of the ocean. It may be that the answer to “how do you keep cars from killing people?” is simply: you don’t. You re-empower the person behind the wheel to negotiate the roads with their own judgment, and trust the social fabric to direct the traffic. Posted in Transportation. Tagged Shared Space, Hans Monderman, New York City. Sounds great in theory…but there’s a reason why the Autobahn does not exist in the US. 2000 Euros to get a license in Germany is one of them. Perhaps it works in Europe. In the US, though, drivers see going at the speed limit as their “right.” Indeed, many of them see going even faster than that, five or ten mph, at least, as a given, and God forbid anyone, another driver, or a vehicle that simply can’t go that fast, much less a pedestrian who has “no business” being on the road, get in their way. I have driven in the following conditions, more than once…winding, twisty, mountain road, with curves and descents clearly marked as dangerous, in the pouring rain, with out of State plates showing me to be unfamiliar with the road, and yet, time after time, another driver will tailgate me, flick his lights on and off, and honk the horn, even though I am going the posted speed limit, and even though there is no place for me to pull over and let him pass. Do we really want to put children and others at the mercy of the average American driver, by having officially shared, as opposed to segregated, spaces? To make our streets even minimally safe for pedestrians and others who use them for cycling, to cross to the other side, getting in and out of cars and other vehicles, etc, we need to have more speed bumps, not fewer, and more aggressive enforcement of speed limits, not less. I do agree that we can’t make a street look like a big highway, but then expect that drivers won’t treat it like one. To get drivers to slow down, there do have to be obstacles. Not so many lanes. Clearly marked bike and bus lanes. Speed bumps. Median strips designed not as “Forgiven zones” for cars, like out on the Interstate, but as safe zones for pedestrians. One major thoroughfare in my city, which is also a busy shopping and residential street, and was once known as “the boulevard of death,” reduced pedestrian fatalities a great deal by adding several of these zones (along with lowering the speed limit, and enforcing it). Crossing the broad street involves crossing fewer lanes of traffic, and more time in the safe, median areas. A late crosser will wind up in a safe median, rather than stranded in multiple lanes of traffic. Several of these areas break the street up into four (service road and main road in both directions) and sometimes even more “bites,” instead of just two. With only a lane or two in front of him, a driver is less likely to treat the road as a highway, but with three, four or more unbroken lanes, traffic will not slow down, no matter what the posted speed limit. Another thing to consider is rather than have the entire street be thought of as shared space, make pedestrian crossings, even those not associated with any cross streets, strict right of ways for pedestrians. Many New England towns have this feature. At first, drivers unfamiliar with them are surprised that they “have to” stop for people (who are not even schookids!) crossing the road in the middle of the block, with no traffic light, or crossing guard, or side street, or anything at all, to “back them up.” But drivers get used to it quickly. Of course, pedestrians still need to be on their toes, as it only takes one driver unfamiliar with the rules or scoffing at them to cause death. Again, though, the notion is not so much shared space as it is expanding the pedestrian safe zone. And “clarity,” rather than “ambiguity,” is the means for getting that segregation. The pedestrian crossing is clearly marked on the pavement. A little stop sign, and another sign explaining that cars MUST stop for pedestrians in the crosswalk, are present as well. And, to ensure that there is no ambiguity, the rule is always in effect, including late at night, on weekends and weekdays, during school hours and not, and so on. And this feature not only promotes safety but make the town more pleasant and efficient to use as a pedestrian. A person need not walk to a distant side street to cross the main street. Stores, and other commercial or social destinations, and housing, are on both sides of the street, and a person can amble from one side to the other, in comfort and safety, and window shop or compare menus and so on, rather than having to try to negotiate either the traffic, by jaywalking, or by rigidly planning what he wants to do in advance so as to always be on the correct side of the street. Children playing on the street, though, except in extremely rural areas or special circumstance, eg very quiet cul-de-sacs on suburban streets that are not used much except at rush hours, is something that I think we are better off without. Suburbs have yards. Rural areas have extensive open spaces. And we should make sure that all areas, including urban ones, have sufficient playgrounds and sports fields for children to use. Cars, no matter the rules and the engineering, are just too fast to be safe around pre occupied, playing children. Also, rather than scoff at pedestrian safety training, we should be encouraging it. When I went to school, we were all taught the basics, the rules of the road, just as cyclists and drivers are taught them. Now, no one seems to know them. Unless there is a sidewalk, or some compelling, countervailing reason, a pedestrian should always walk on the left side of the road, facing traffic. I see folks doing the opposite all the time. How they can feel safe on the narrow shoulder of the road with cars and other vehicles coming up behind them that they can’t even see is beyond me! And, of course, pedestrians should only cross the road at intersections or designated crossing lanes. Children (and others) should not chase a ball, a pet or one another onto the road. Safety is everybody’s business, not just the big bad car drivers. Don’t even get me started on cyclists, who are some of the worst scoff laws and routinely endanger pedestrians in ways that most car drivers would never even consider. Where I live, the majority of cyclists, I would say seventy per cent, or more, don’t even stop for red lights! Rather, at best, they slow down a little and glance around as they weave their way through. Sure, they usually see a car, if one is crossing, but a pedestrian? Not likely. For an example of shared space there is a video on youtube of traffic and pedestrians near Meskel Square in Addis Ababa. Amazing! Remember that what works in the Netherlands may not work so well in the UK or US. And the changeover period could be carnage. News flash: kids still play in the streets. No, not in traffic-heaving arterial roadways– but on quiet residential streets like the one on which I live in Baltimore today. And even in 1900 I doubt many kids played out in the middle of Broadway in NYC or Michigan Ave in downtown Chicago, which would have been thronged with carriage, horses and wagons. Quite a thought provoking article. 1 additional point I would like to make is the culpability of the dumb pedestrian of the 21st century who crosses roads with his earphones plugged in, or his nose buried in his iPhone browser. Awesome. Left-Right coalition for shared-space planning! “Shared space” is *not* the reason for the change in vehicle fatalities and injury rates on Dutch roads. CROW which is the Dutch road design handbook actually discourages the use of “shared space” designs in high-traffic areas as they reduce (percieved) security and safety. What the Dutch *did* do was enact a program of modal segregation with the purpose of physically reducing points of conflict either with physical segregation or time-based segregation. These include cycle tracks, pedestrianization of “downtown” or city center areas, all pedestrian and all bicyclist signal phases (with cars stopped), advanced pedestrian and bicyclist phases, advanced public transit signal phases, and “home zones” in housing districts (which may be likened to “shared space” but not exactly the same as Poynton’s example). Further the municipal and regional authorities often divided city center districts or important city neighborhoods into sectors with which one could not drive from one to another without returning to an arterial road, while enhancing pedestrian and bicycle direct access further reducing the volume of people using roads with many points of conflict between modes. This was a fascinating and really informative article–thanks.
. You re-empower the person behind the wheel to negotiate the roads with their own judgment, and trust the social fabric to direct the traffic. That’s brilliant if you have a good social fabric. But it would be completely stupid to try the same in ‘stand your ground’ territory. I think that is is not a bad idea. I really do not think lots of signs and speed cameras really help. I think that cameras in particular change a drivers priority from looking out for other road users, to looking out for yellow boxes. I read an article a few year back about how drivers slow down when you remove all road markings etc. Seems sensible. The reduced speed of the shared spaces of yore did not necessarily mean less danger. Just anecdotal, but my great-grandfather and my great-great grandfather were both killed by accidents in the busy pre-automobile streets of old. My great grandfather was run over by a street-car in Philadelphia, and my great-great grandfather was struck by a barrel that fell loose from a wagon and rolled down a hill in Brussels. Nevertheless, interesting ideas, and I certainly can’t say I find the increased enforcement/entrapment model very appealing, but maybe that’s because I just don’t want to get caught. My own neighborhood in suburban Virginia was built 10 years ago with a modified “forgiving roads” approach of the sort typical in modern suburban developments. Wide roads, smooth curves, three major streets that each only hit the other with a single T intersection. Minor streets intersect the major also mainly with T intersections (plus one roundabout). Once residents started moving in, the first organized complaints to the HOA were parents calling to Do Something about how fast cars drove through our streets. More signs! No effect. Speed bumps! No effect, except to create bottlenecks of people braking from 40 to 5 at the speed bump, then flooring it once over the bump. Two major snowstorms later, the plows had scraped off the speedbumps anyway. Finally, we persuaded the HOA to try painting more lines inviting parallel parking along the major roads. (Parking was already an issue, but people tended not to park on the major streets with the 40+mph traffic.) Ever since the parking lines started attracting regular lines of parked cars to narrow the major streets, average speeds have been down. Not a perfect solution – it’s still not uncommon for people to do 35 on our residential streets. But anecdotally, I encounter far less aggressive driving when I tool around the neighborhood at 25 in second gear than when we first moved in. As are trees. Trees lining the street, trees in the medium. Trees on the side of the street seem to slow drivers’ down. And trees in the medium make it clear that the medium is meant as a safe space for pedestrians, not as a “forgiveness zone” for cars. I think sidewalks and painted cross walks are good too. They remind drivers that pedestrians are around. And, without them, many driver just assume that the road is meant as a highway, perhaps a rural one, with nobody on foot nearby, and that they can go as fast they like. So are trees. Trees along the side of the road slow drivers down. Trees in the medium remind drivers that the medium is meant as a safe space for pedestrians, and not as a “forgiveness zone” for cars. Sidewalks and painted crosswalks are good too. As they remind drivers of the possible presence of pedestrians. And, without them, some drivers get the idea that they are on a highway, with nobody on foot around, perhaps in a rural area, so that they can go as fast as they like. But, ironically, given the photo above, those signs on the side of the road telling you your speed, in comparison with the posted speed, are useful too, because, again, they remind the driver that there is a speed limit, and that there might be less passive forms of enforcement around! Great article!! Really hope planners stop building these stroads!! I would echo Andrew’s comment. Shared space is a cute concept. It works for quiet streets and small towns with grid systems. Shared space is certainly an underutilized tool in the planner toolbox. But isn’t a silver bullet. We need segregation of modalities on major streets, and they do do that in the Netherlands. An inspiration for all of us ! Interesting to note that it was streetcar (electric railway)companies that began pushing for state driver’s licensing and drivers education. In most locales before 1920 you could be a small child, legally blind or even insane and able to legally drive an auto. There was no requirement for any type of training or education. The auto industry and their lobbying organizations initially resisted licensing much like the mobile phone industry first resisted restrictions on using phones while driving. The motivation for streetcar operators to push for licensing was that autos were taking an ever increasing toll on people boarding or alighting streetcars. Thus, the original goal of auto safety education before it was hijacked by the AAA, was to enforce the concept of the street as a shared space.